If you have been diagnosed with Type 2 diabetes, then you already know that the first course of treatment your doctor will recommend is diet and exercise. In the event that those lifestyle changes aren’t effective in controlling your blood sugar levels, the next thing your doctor may recommend is Victoza. Here are some things you should know about Victoza. 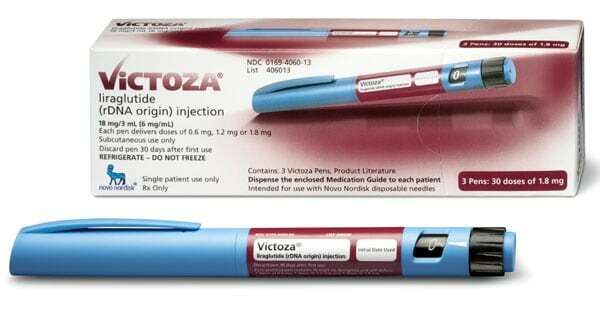 Victoza is a non-insulin injectable medication that is prescribed to patients with Type 2 diabetes. It is manufactured by the pharmaceutical company Novo Nordisk and was approved for sale by the Food and Drug Administration on January 25, 2010. The common medical name for the drug is called Liraglutide, but is sold under the brand names Victoza and Saxenda. Victoza is part of a class of diabetes drugs known as incretin mimetics, which are designed to control blood sugar levels, by mimicking the Glucagon-like-peptide-1 (GLP-1). The Glucagon-like-peptide-1 (GLP-1) hormone works as both an incretin and as a neuropeptide. An incretin is a hormone that is designed to lower blood glucose levels. A neuropeptide is a molecule that allows communication between neurons. When you are prescribed Victoza, your doctor will start you out at a dose of 0.6 milligrams each day for 7 days. Next, your doctor will increase your dose to 1.2 milligrams each day. If this dose is not effective in managing your blood sugar levels, your doctor may increase your dose to 1.8 milligrams daily. Victoza should be taken at the same time each day, can be taken any time of the day and may be taken with or without food. The Victoza pen can be injected in the abdomen area, the upper arm area or the upper thigh area. You should rotate injection sites each day to prevent or minimize bruising. The Victoza injectable pen comes with disposable needles. It is important that you use each needle only one time and be sure to properly dispose of the needles, according to the specific laws in your state. If you miss a dose of Victoza, be sure that you take it as soon as you do remember. If it is close to the time for your next dose, skip the missed dose and take your next dose as scheduled. What Is the Victoza FDA Black Box Warning? The Food and Drug Administration (FDA) required Novo Nordisk, Victoza’s pharmaceutical company, to add a Black Box Warning Label to the drug. Medications with a Black Box Warning Label is an indication to its users that the medication may have risks associated with it that are serious or life-threatening. In studies done on rats, Victoza causes tumors, including those that are malignant, of the thyroid C-cells. The FDA concludes that it is difficult to say whether or not Victoza causes this condition in humans. Victoza, like most other medications, has some side effects associated with it. If you experience any of the major side effects, contact your doctor right away. With minor side effects, these usually disappear as your body gets used to Victoza. If they don’t, contact your doctor. This isn’t a complete list of Victoza side effects. For more information on all the side effects associated with this medication, click on the 5th link in the References section below. What Are Victoza Users Saying? So, now that you know about Victoza from a medical standpoint, it is important to hear what taking Victoza is like from patients who take it. On WebMD, users rated Victoza in three areas: Effectiveness has an average rating of 4.11 out of 5, Ease of Use has an average rating of 4.53 out of 5 and Satisfaction has an average rating of 3.84 out of 5. When it comes down to the verdict on Victoza, it has generally had positive results. In fact, on Victoza’s official website, www.victoza.com, medical studies compared patients taking Victoza versus patients taking Byetta and Januvia, a pair of other diabetes drugs. The results showed that those taking Victoza reached their A1C goal levels of under 7%.